A short and unrelenting autobiographical account of the author’s coming of age in a small town in northern France. Originally published in French, Eddy was only 21 when he wrote this book. Much of this was hard for me to read. Eddy grows up poor and gay in a large family, a target of obvious scorn by his parents, his siblings, his classmates, and the people of his town. The depiction of French society here is a sharp contrast with what many of us Americans picture when we think of the region, with its artistic sensibilities and beautiful scenery. In Eddy’s town of Hallencourt, jobs are scarce, children drop out of school, and women have their babies young. Alcoholism is everywhere, violence is routine and part of a typical day’s events. Growing up, Eddy is assaulted daily, spat upon, and called derogatory names because his mannerisms, speech, and behavior does not fit the expectation of what is “manly.” He submits to these beatings because brutality is all he knows. His sexual initiation, which is not entirely consensual, is the hallmark of this book, because it’s after this event that he decides to take on the persona of ‘tough guy.’ He fails miserably, however. 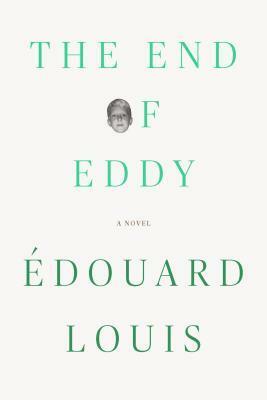 Eddy comes to accept his own homosexuality and eventually gets accepted into a theater program in a nearby city, pursues a degree, and eventually changes his name to Edouard Louis. As much as I didn’t like reading this due to its graphic descriptions of such horrible things, I have to give it five stars. Something in me broke while reading this. It’s terrifying because of its urgency–you know that this kind of terrorism is happening to someone else as you read this. Even though this book takes place in France in the 90’s, it could be present day in your city or really anywhere in the world where people still practice the routines of toxic masculinity and violence. Thoughtful review! There were some passages I struggled with reading as well, but I was glad to have finished the book. His other novel is written in a more disjointed style. I can certainly understand. There are times when I find I can read certain kind of material with stipulations, other times when I just can’t. This book was pretty major in heavy content, and even though I liked the author’s writing, I would NEVER read this again. As far as I can tell, one of the authors who writes the most bleak and depressing gay-themed books is Jim Grimsley. I read two of his novels, “Dream Boy” and “Winter Birds,” and after “Winter Birds” I decided I needed a break from his writing (even though his other books are on my to-read list.) I heard the author of “The End of Eddy” also wrote a memoir, about being raped I think? Sounds like another one that would be psychologically difficult to read.